The General Cemetery Company are pleased to advise that we have now completed phase 2A of the rebuilding of the wall. Phase 1 involved the construction of new foundations to 10 bays of the wall and Phase 2A is the rebuilding of 5 bays of the wall to their original design off the new foundations. The rebuilding has been done using bricks and stone dressings salvaged from the collapsed and taken down sections of the wall. We are looking at how we can fund Phase 2B which will see the next 5 bays rebuilt off the remaining section of new foundations. Obviously this is an expensive process given the quality of the wall. We will update all once we have a planned start date for this phase. 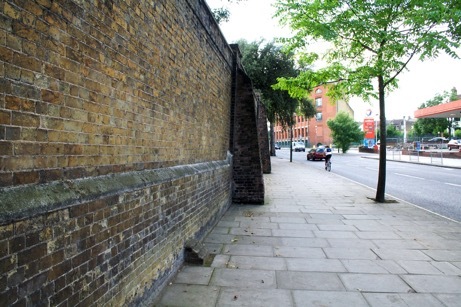 The General Cemetery Company are delighted that the first phase of work on the rebuilding of the boundary wall along Harrow Road is almost complete. This phase with some funding from English Heritage has involved taking down 10 bays of the remaining section of the wall and foundation and forming new foundations comprising of piles and a concrete beam to connect the tops of the piles. This work is on target for completion by the end of July along with the reinstatement of the area of footpath disturbed and the temporary hoarding reinstated on the line of the wall. The cemetery will then employ a small specialist masonry contractor who will commence in August and initially carryout a series of sample panels to establish the quality and agreement for the brickwork and then to rebuild 2 complete bays of the wall or approximately 18m length to match the original wall using bricks salvaged during the various phases of taking down. Subject to funding they will continue to rebuild further bays off the new foundations until 10 bays have been completed off the new foundations. In the meantime the cemetery will continue to seek funding for further phases of rebuilding adopting a similar approach of taking down and building foundations using specialist contractors and then follow on works for the actual building up of the wall itself above ground level. It is likely though that these further phases will take a number of years to complete given the sums of money involved to carry out the work. As all know this has been a long and frustrating project for all concerned. The following is just a brief potted history of the efforts to date. When the section of the wall fell down the cemetery's first priority was to make the area safe and review all remaining sections and implement emergency propping to support practically the entire wall along the Harrow Road and an area within the Dissenters section. 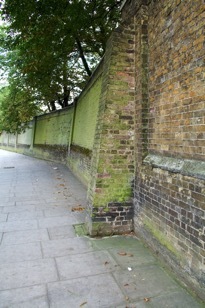 Since that time we have been working with structural engineers, officers from English Heritage (EH) and the Royal Borough of Kensington and Chelsea (RBKC), and the various utility companies who have placed services within the footpath very close to the boundary wall to find a solution for rebuilding the collapsed section and making the remaining wall safe. 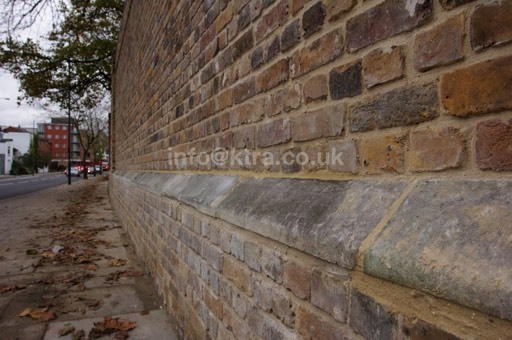 Initially a design scheme was developed with proposals for rebuilding the collapsed section and introducing numerous buttresses to support the wall along the full length of the Harrow Road. Some of these buttresses were on the cemetery side and others on the footpath. This solution was developed to try and keep as much of the original wall in place and to avoid disturbing any of the graves in the cemetery. Listed building consent and planning permission was applied for and granted for this scheme. More detailed investigations were also made into the footpath to establish where the various utility services were and discussion had with the respective companies. Unfortunately these investigations brought to life the fact that BT not only had ordinary cables in the footpath but also fibre optic cables within the zone where many of the new buttresses were proposed. The implication of this given the buttresses involved piling and beams on the footpath was that BT felt this approach would require the fibre optic cables to be diverted at a potential cost of £1-2m. These further costs made this scheme unsustainable when added to the already high costs for actually carrying out the works. Throughout this stage the wall was being monitored for any further movement. During 2010 the wall was noted as having moved substantially over a short period. This obviously raised further concerns over its stability. While scaffolding had been put in place this was as a protection to prevent excessive progressive collapse if a section did start to come down and had by this time been in place for some time. Given the seriousness of the movement it was agreed that a Dangerous Structure Notice be served on it by the local authority and emergency protective hoardings put into place. the long term solution and that the short term solution to make it safe was to partially take the dangerous sections down to a safe height of about 1m. 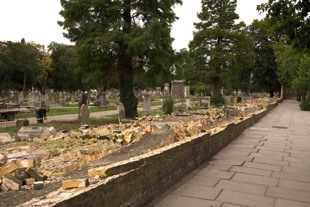 This work was carried out in 2010/11 with bricks and stonework being salvaged where possible for future re-use and a temporary hoarding being erected to help maintain the cemetery security. Given this change in approach new design proposals were developed for the rebuilding of the wall. Options were again considered looking at if the wall should be rebuilt as it was or if railings should be considered with design sketches produced for consideration. EH and RBKC both stated they would not be able to support such a change and given that EH were awarding a grant to assist with the costs of the actual works and that Listed Building Consent and Planning Permission were unlikely to be granted the railing option was not developed. The new proposal for fully taking the wall down and rebuilding on new foundations was therefore finalised and new applications made and consent granted for Listed Building Consent and Planning permission. In 2011/12 the works for taking down and fully rebuilding 11 bays were tendered and a preferred contractor identified. Unfortunately this contractor eventually dropped out of the project before the work commenced forcing a rethink on the best way forward for achieving a cost effective way to get the longest length of the wall rebuilt using the funds available including the grant money from EH. It was therefore decided to tender as a first phase a contract for just the further taking down and formation of new piled foundations to specialist contractors with the intention that the cemetery appoint direct a small masonry contractor who could then progressively as further funding was available carryout the actual rebuilding of the wall. It is this first phase that is about to be completed. 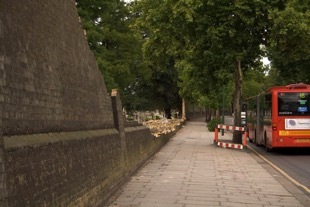 Other frustrations that have occurred on the project in recent times have been the instance of RBKC that given the need to temporarily affect the footpath to allow the new foundations to be constructed a legal agreement called a section 278 agreement is entered into between the cemetery, the contractor and RBKC to ensure the footpath was re-instated. Such legal agreements are normally used for developments that affect the highways such as new housing estates which need a new junction formed or roundabout etc. This further delayed the start of the current contract and obviously added to the costs. Further during the works themselves BT ducts in the first bay taken down were found to be much closer to the wall (practically abutting it) than had been found in all of the trail holes dug in the footpath during the design development which further delayed things while a solution to this issue was found. Finally in terms of looking forward, the movement of the wall is continually being monitored. It is likely that further sections will need to be taken down to a safe height before funds are in place for it all to be rebuilt. In the meantime the cemetery is looking at how it can raise funds for further phases of forming the new foundations and rebuilding. Realistically it is likely to be a number of years before the wall is fully rebuilt. Consideration is also being given to replacing the temporary hoarding with a more suitable temporary fence. 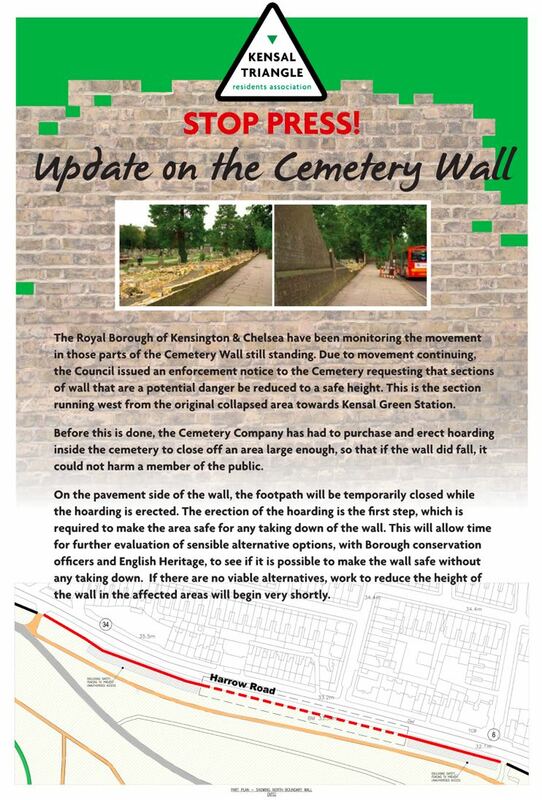 We obviously wish to extend our thanks and appreciation to the Friends of Kensal Green Cemetery for their continued support and understanding of the issues the cemetery faces not just in relation to the boundary wall. 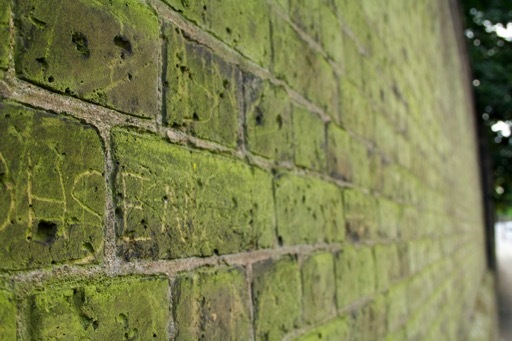 The wall has been a contentious local issue for many residents since it fell almost 2 years ago, the end of the August bank holiday will mark the 2nd anniversary of its demise. It is also one of the most ill informed area’s of conversation too, with many conflicting reports on what actually happened and what will happen to rebuild it. We were briefed on 7th July by Tony Barnard, from the London Cemetery company on the status of the wall, and how it is progressing. It is now widely accepted that the wall “Fell” at about 2 am. There does not seem to be any one significant factor to determine an exact cause for why it fell. After the wall fell, they tried to recover as many bricks as possible, but owing to the nature of the collapse a lot were broken and were unusable. Then they set about trying to peruse their insurers to make a claim on the wall. However the claim was refused. This was then appealed, but even after appeal it was still refused. The reason for the refusal is quite clear: there was no discernible event that caused the collapse of the wall. Although this is very frustrating, it is generally felt that there is little that can be done to overturn this decision unless the collapse could be pointed to a particular event, which looks unlikely. This leaves the cemetery company to foot the bill for the wall replacement & further costs to repair & make buttresses for other parts of the wall. On further close inspection of the wall, which was carried Out by structural engineers and surveyors, there are other sections further up Harrow Road which remain up, but lean in or out of the cemetery which will need to be supported by new buttresses to make them safe. In some cases these will need to go on the pavement, much like they do in the pictures above of existing buttresses, but care will have to be taken as there are services and cables under the pavement. The railings issue has now been abandoned, as the cemetery cannot justify an extra £100,000.00 for what is essentially a cosmetic change. This also as implications for planning and funding. It will complicate the planing process, as there will have to be a local consultation, and there is no guarantee that everybody wants this. Most people seem to be of the opinion that it is about 50/50 split between the wall/railings argument. Due to a consultation this would also slow up the process considerably. Replacing the wall “as was” does not require additional planning consent. As for the funding, it is possible that some of the wall replacement can be funded through English heritage, although there is no guarantee of any money. However if the railings were chosen this would not be possible as the wall is also a listed building, and so any change here is going to complicate the issue further. There are also some issues for the wall inside the cemetery, at the dissenters chapel, as this is also leaning considerably and needs to have some work done to rebuild it. It is possible that due to the high costs involved this may be Phased in stages, to make it more manageable. There also some internal roads which need upgrading/replacing as they are very old, and leaving them full of pot holes is not feasible for the clients of the cemetery. The Next Stage is to mark onto plans the locations of all of the graves in the areas affected by the proposed buttresses — the records of the company have been reviewed to identify how many are in each grave but the actual location has not been marked onto the survey drawings of the areas. Once this has been completed the designs and locations for the new buttresses will be fine tuned to avoid any exhumations where possible. As some of the graves inside the wall are not marked, but they are mapped out on the cemetery companies plans. Then Planning consent & listed building consent and Home Office Licenses or C of E. Faculties in relation to exhumations will be sought, hopefully in a parallel process to speed it up. Then the plans will be put out to tender. Hopefully this will result in the successful contractor commencing work.